It's not only a solution - it's a 4K revolution. UVX Ultraline is optimized for state of the art signals of DisplayPort 1.2 at 4K, analog audio, RS232 and USB 2.0. The transmission distance of 328 feet over one CAT-6a/7 cable is completely lossless. UVX Ultraline KVM extender supports 4K-Cinema resolution of 4096x2160 @ 60Hz with perfect color coding with 4:4:4 @ 8 bit per color. Optionally, you may connect the Local (CPU) and Remote (CON) units to a 10GB Ethernet network switch, which will in turn support a total point-to-point extension distance of 656 feet (200m). The perfect tuning of kvm-tec video compression with a low latency allows a delay-free transmission of the signals. USB and video are transmitted via one cable. The DisplayPort extension without loss of quality allows 4:4:4 4K-Cinema video @ 60Hz to be transmitted in real time. The CPU (Local) and the CON (Remote) units each have two video outputs acting as a 4K video splitter, allowing the original 4K video coming from the video source to be duplicated and displayed on two 4K screens. If the video source is at 2560x1600 resolution then - being that UVX1 Ultraline supports DisplayPort Multi-Stream Transport (MST) - the two screens could show two different video streams. The transparent USB 2.0 interface supports keyboard, mouse, tablets and touch screens, sound modules, printers, smartcard readers, serial adapters and more. 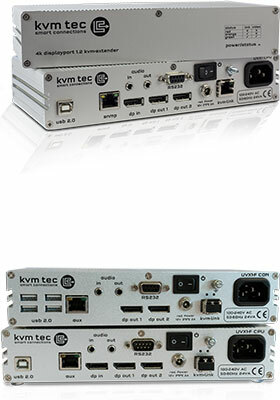 kvm-tec's security feature - USB save - prevents the intrusion of computer viruses via the transparent USB interface by disabling mass storage devices support such as USB sticks and external hard disk drives. However, a USB 2.0 memory option is included (and can be activated by the user) supporting USB memory stick and USB hard drive. When enabled, this option allows the use of a USB memory stick or a USB hard drive for transferring data. With the included Matrix Switching System, UVX1 can be used with a dedicated 10GB Ethernet network switch to create one-to-many and many-to one configurations, or even a complete many-to-many KVM matrix switching system up to 480 endpoints without any additional hardware. 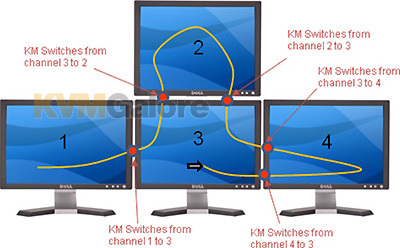 Additionally, KVM-SM2000 - kvm-tec's intelligent Switching Manager software (ships included) provides easy and intuitive management of all KVM extenders in the switching system. Switching can be performed either via the on-screen display (OSD) menu with key combination or directly via the Switching Manager. The intelligent software kvm-tec Switching Manager enables convenient management and intuitive operation of KVM extenders in the switching system. A Windows PC or tablet with a network interface is required for commissioning and operating the software. With 4K Multiview Commander - a kvm-tec innovation - the video contents of 4 different PCs - each with Full-HD (1080p) resolution - can be simultaneously displayed on one 4K monitor in a MultiView style, with the screen divided into four quadrants and the video from each computer being displayed in one quadrant. Being used in conjunction with Switching Manager software, the four PCs are being controlled using only one keyboard/mouse, and the user switches control from one PC to another by positioning the mouse-cursor over the quadrant showing the video from the computer the user wishes to control. Ideal for command and control applications, 4K Multiview Commander enables ergonomic and space-saving workflow in control and monitoring rooms.